Another layer to this wasteful mess we humans have created is brought to you by the clothing industry. High water usage; pollution from chemicals used to grow fibers for clothing and chemicals used in dyeing and preparation processes; the incineration and landfill-dumping of massive amounts of unsold clothing. Its clear that this industry, and our consumption habits, need to be seriously looked at. Up to hundreds of thousands of plastic microfibers get washed out of our synthetic clothes each time we wash them (AND 60% of the clothes produced are made of plastic ). These microfibers end up in our water systems and eventually in the ocean (and then into fish and into us!). Please watch this 2.47 minute video on this hidden problem with our synthetic clothes. With basically every sustainability topic, the thing that will have the most impact is to BUY/CONSUME LESS. This holds true for clothing too. We need to buy AND throw away less. For the clothes we do have, we need to care for them (repair them and wash them properly) so that they can last as long as possible. When you want to wear something new – consider borrowing, swapping or thrifting before buying a brand new piece of clothing! Dyeing, cutting, and re-fashioning old clothing are also all ways to breathe life into older clothing. Our friends at The Fiber Craft Studio are hosting a plant dying “cafe” on Friday, April 26th where you can use indigo plant based-dyes to give your clothes a total update. Have a clothing swap with friends (try it seasonally!). 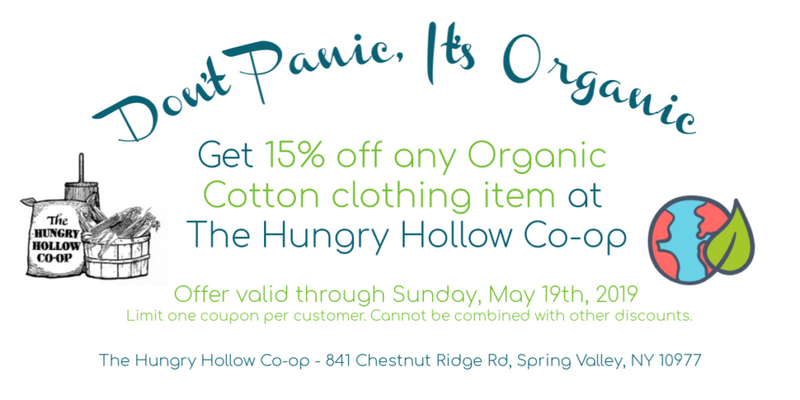 We’re hosting one today, Earth Day (April 22nd from 11 AM to 4 PM) at the Hungry Hollow Co-op! Never let clothes and other textiles go into the garbage! Check out some great infographics from The Ellen MacArthur Foundation. What are some ways you can breathe new life into old clothing? Let us know in the comments! 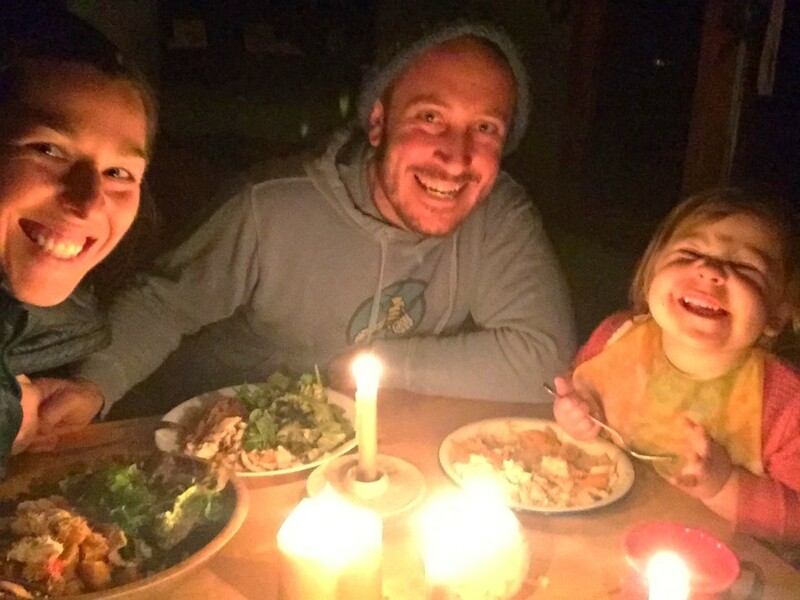 While we may not have them every night, Daniel, Odelia, and I have been enjoying our candle-lit dinners immensely. My awareness about turning lights off when I’m moving rooms (or not turning them on at all during the day) has been satisfying, and I’ve switched to doing all laundry using cold water. I’ve also programmed our thermostats to ensure we’re not wasting energy while we’re not home, nor at night when we are cozy in bed. I have some self-judgement that I wasn’t paying more attention to these things before now, but all we can do is continually do better, right? How is your electricity reduction going? Are there changes you have tried to make? Another way to have an impact around sustainable energy is to choose your electric supplier. While we don’t have a say in our electricity distributors (specific companies that own and maintain the poles and wires that get to our homes), we can choose where our electricity comes from (including making greener choices – i.e. wind, solar, hydroelectric). I was recently directed to NYS Power to Choose by my gas and electric distributor (Orange and Rockland) and was happy to see that once you put in your zip code the site easily compares electric supplier’s rates in your area and tells you if they are green and how so. I found a few sites (there seem to be several) doing a similar thing in NJ (Power2Switch and Choose Energy). Daniel and I chose a new green supplier, which I not only feel better about morally, but which will also save us money too! I hope you’ve enjoyed our foray into this electrifying topic ;). I can’t wait to explore a different sustainability theme with you all next month. Until then… stay warm (but not too warm) on these cold winter nights. Don’t forget to take advantage of the ‘20% off candles’ in December’s Dirt that our friends at The Hungry Hollow Co-op have offered in conjunction with our energy reduction efforts these past two months! Offer expires January 15th! In the last installment of our Sustainability Scoop we looked at some pretty crazy numbers regarding how much food is wasted in our country and some of the harsh effects this is having on our planet. A huge issue is that food waste that is thrown “away” gets trapped in landfills and produces methane gas – a greenhouse gas that the Environmental Defense Fund states is 84 times more potent than CO2 in the short term! You may ask: if rotting food in landfills produces methane gas, does rotting food in a compost pile do the same? The answer is NO! Thank goodness! Food waste that gets buried in landfills goes through a process called anaerobic decomposition or digestion, due to the lack of oxygen in the landfill. 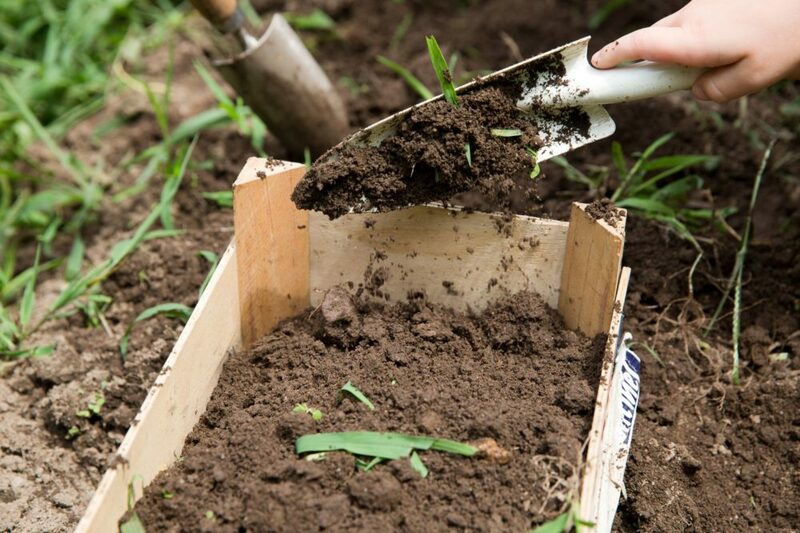 This means that the microorganisms that break down the buried organic material don’t need oxygen to survive. An unfortunate byproduct of their decomposition process is methane. Food waste in properly aerated compost containers is exposed to oxygen, and thus undergoes aerobic decomposition. The little microbes that carry out this process use oxygen to do so and don’t produce methane as a byproduct – hurrah! In fact, the main byproducts of this process can be taken up immediately by plants. Bonus: if properly aerated, compost shouldn’t smell (unlike a landfill). This is only ONE reason why composting is preferable over sending food to the landfill, but I think its a good enough one to start with. So, let’s not waste anymore time! Let’s get down to business and get composting! If you live somewhere where you don’t have space to compost, you AREN’T off the hook. 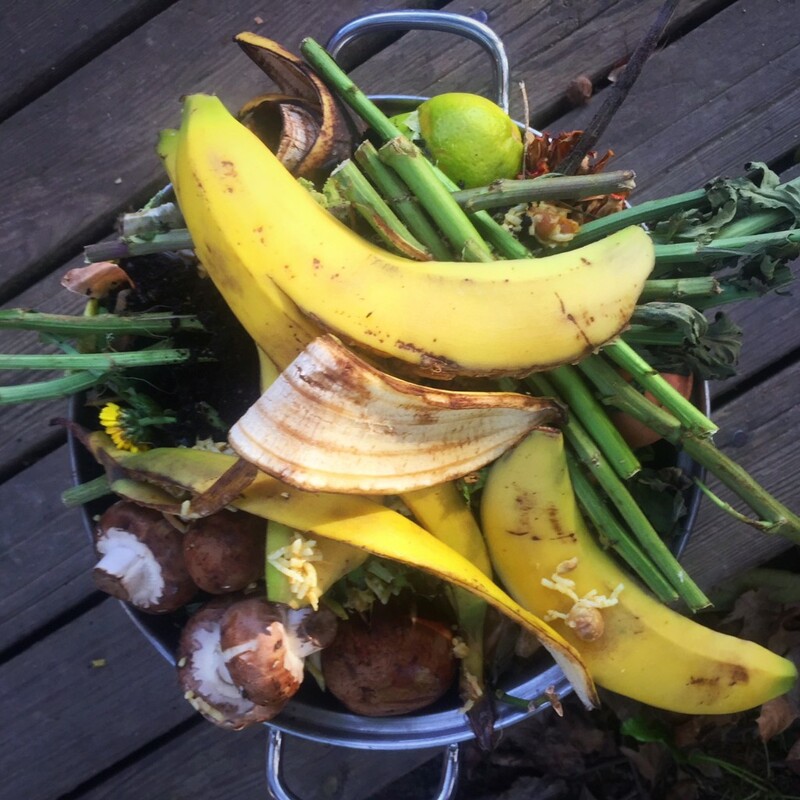 The easiest way to still compost is to set up a compost bowl or container in your freezer (use it as an excuse to clean out your freezer – if your freezer is anything like mine, it could use some TLC) and then take your bucket each week (or however often if fills up) to your closest Food Scrap Collection location. Here is a link to NYC locations. For those outside of the city, ask a friend who has a compost system if you can give them your scraps or check with a local farm/garden about their options. Also, most farmers markets have receptacles – check your local market today! 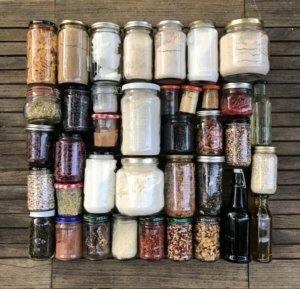 If you are interested in starting your own compost system, here is a beautifully laid out resource. For those already composting – celebrate the good work you’re doing for our planet! For me, the next step is reduce, reduce, reduce. Let us know about your composting journey in the comments below. I look forward to hearing from you! Well….Spring was not as ‘in the air’ as I had excitedly pronounced in last month’s Dirt, was it? I hope you all stayed warm and are as excited as I am to finally be seeing some real signs of spring. One of my favorite signs is the faint red hue on the trees tops (and the pink on the cherry trees) as the buds plump up, hinting at what is to come! 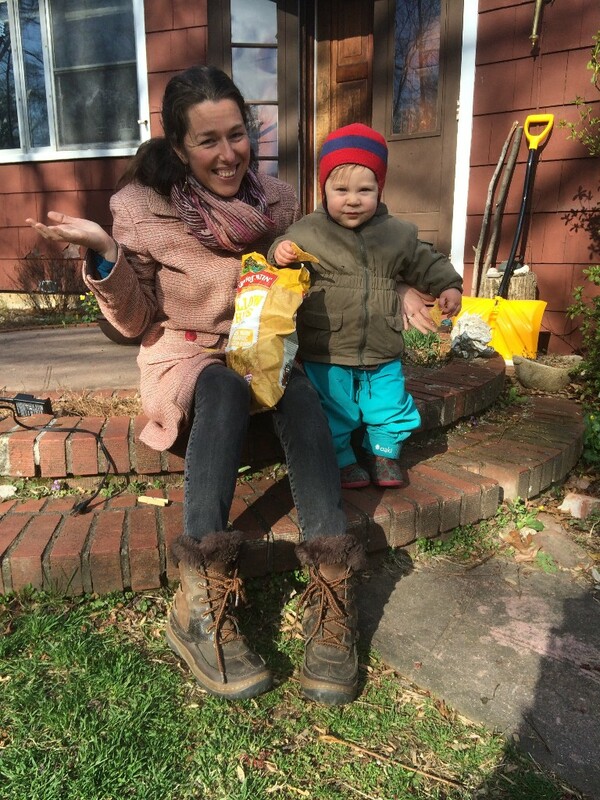 I’d been stressing about writing this month because, truth be told, I didn’t do my homework: there were no home made tortilla chips created in the Dunn Bieber household this month. Daniel said, “Well, just tell everyone that you didn’t do it. People love hearing when other people fail.” I laughed, but in truth, I agree. I think as important as sharing our successes is, sharing our challenges (better word than ‘failures’!) is of equal value. My mantra to get over this hump: If at first you don’t succeed, try, try again! Don’t give up. I’ve been experiencing that the first time you try a new sustainable choice is usually the hardest. Once you get the kinks out and don’t need to rely so heavily on reading directions, getting set up, and potentially buying materials/ingredients you might need, things really do move along and can get folded into your current routine. If you do get beyond the start-up and make a permanent change, that is awesome. Contrarily, some choices might not be right for you at the time that you try them out, and its okay to let them fall by the wayside to be picked up another time. I guess the chip making was on the slightly more complex end of the spectrum (for me) and didn’t quite make the cut…yet. I do hope to try the idea out again though and see if I can bring it into my routine. In other news, an important day for sustainability is coming up! I’ve been thinking about Earth Day and so grateful for the intentionality this day brings. It both increases awareness and gathers people to take action. I encourage you to do a quick google search for Earth Day activities in your area and if there isn’t something that catches your eye, come up with something your family can do to mark the day! To spark some ideas, here is a great resource from The National Geographic Kids called: Tips for Protecting the Earth. This is the last month of the Garbage Can Challenge for the year (final post coming in next month’s Dirt). Let’s all do our extra best to REDUCE, reuse and recycle this month! In February’s Dirt, Sondra Grewe deGraft-Johnson and Emily Selover invited us to join in their pledge to be straw-free for the whole month of March. Did you participate? Here they debrief the challenge and share future goals for the #StrawFreeNPDC movement and the larger sustainability movement! Sondra: You’d think that eliminating a small piece of plastic from your daily life would be pretty easy, but actually it’s not as easy as you might think. In March, I joined the NPDC challenge to use zero plastic straws for the entire month (and hopefully, beyond). I knew it would pose a bit of challenge for me, since I eat out a few times per week and those occasions are generally where straws come into my life. In fact, the amount and frequency of people eating out and eating on the go has really been on the rise over the past 10 or 20 years, and has contributed to single-use plastic being so pervasive in our society. Most of the month was a success. I would say that during a regular month, before attempting to reduce my straw usage, I probably would have used about 12 straws in a month. This month, I would say I encountered about 3. Being proactive and speaking up about my wish to not have a straw worked well in places where you take your food to go. I actually bought a pack of paper straws for desperate instances where having a straw avoids major inconveniences (Hello, I had to try a Playa Bowls smoothie when they first opened!). In sit down restaurants it could be more tricky, as sometimes they bring water with a straw IN IT to you BEFORE you have a chance to say anything. But overall the majority of March went well. At the end of March I traveled to see my family in Kentucky. On the way home from the airport, we stopped at a family-owned Italian restaurant and were placed with the friendliest of servers. When I explained my straw situation and shared my awareness with him, I thought I had finally hit the jackpot of servers. He was so excited! He agreed that he was trying to reduce his plastic use as well. My first round of water was great – no straw, no problem. But, when he brought us refills, guess what was in the glass?!! A big, ugly straw. And in those situations, what can you do? The straw has already been used. Here I am, trying to be an example to others and yet, as I sipped my drink, I felt like the biggest hypocrite. But I realized when you are dining out, you have so little control. So lesson one from this month – try to eat out less. Thus, more control. Lesson two – don’t be hard on yourself! Celebrate the good you are doing, don’t dwell on the negatives. I can be thankful for every opportunity I have to share my straw mission with other people, like in the case of the server in Kentucky, who really liked the idea. Lesson three- Try to increase awareness of our own habits that get us in trouble. The server was beyond friendly, he had all the Southern hospitality you would expect, but his habits were so ingrained and sometimes human error comes in to play. Those habits and routines we all have are what we each need to challenge day after day until they disappear. We have to train ourselves to make new, better habits! I’m trying to be more conscious of all my plastic consumption and think about what I can do to reduce it in every place and in every way. Emily: Yes! To Sondra’s point about having less control–you’re relying on other people’s memory and like she said, servers have so many things to keep track of! I had a similar experience. I was out with a couple friends and we all made a point to tell the server, “no straws please”. “Oh yeah! I like that! Have you guys seen the turtle video?”, the server asked, referring to a very graphic viral video of a sea turtle with a straw stuck in its nostril. We all agreed about how horrible it was, and the server even noted that he was a vegan. But when the waters arrived at the table…they all had straws!!! Giving straws to patrons in restaurants is a customary practice in many places (I realized this once I started paying attention). So customary that it seems to be second nature and servers do it completely out of habit, even when we request otherwise AND have full conversations about it with them! And who can blame them? They have to be on top of so many details at any given time! When we were debriefing this experience, I realized that perhaps we need to take bigger action than just asking for a strawless drink. Perhaps it would be more effective to speak to the owners and managers directly about shifting their establishment’s straw policy. Maybe if servers asked first, “would you like a straw?” more people would say ‘no thanks’ and we would eliminate the issue of getting a straw we did not want before even having the chance to deny it. It would be a win-win for everyone, not only on the environmental front, but also, what owner doesn’t want to save some money by eliminating a cost that’s often unnecessary? I actually did a bit of research on this and found a statistic from Ardvark (a paper straw company who advocates that restaurants provide straws only on request). They found that, restaurants “that offer straws on demand reduce straw consumption by 40%, diminishing the increased cost of switching to paper straws and allowing restaurants to save money while saving the planet.” Basically, they’re advocating that not only should restaurants only offer straws upon request, but when they do offer straws, they should be paper ones. I like that! The way I see it, as soon as restaurant runs out of their last plastic straw, they should be restocking in paper straws only. I’ve been getting really fired up about beginning a grassroots campaign in my community to get restaurants to be more straw aware! They could even display signs with their straw policy and why they have it, to spread even more awareness. Hey Dirt Reader, Do you know restaurant owners in your local community? Would you be comfortable speaking up to your local business association or chamber of commerce about a new local straw policy? Who’s with me!? Sondra and Emily: Here’s what we can take away from all this: We can’t despair and we can’t give up, despite how discouraging it can be to see a straw in your own or someone else’s glass. We have to remember it’s a process and it starts with all of us educating others! Even just telling those closest to us can start the trend. Sondra’s husband Kobi has been declining straws in her company and we can only hope he is doing it when he’s at work as well. Emily’s friends are all afraid [in a good way :P] to even say the word ‘straw’ around her. In addition, we have to get back to the motto of our childhood – Reduce, Reuse, and Recycle. It’s a topic for a whole other time, but we’ll leave you with these hope-inducing ideas from Green Peace Australia for even more R’s than just the classic three. On that note, Happy Earth Day to all and we hope you’ll continue on this straw free journey with us! Did you say no to straws during the month of March? How’d it go? We’d love to hear your experiences!! !